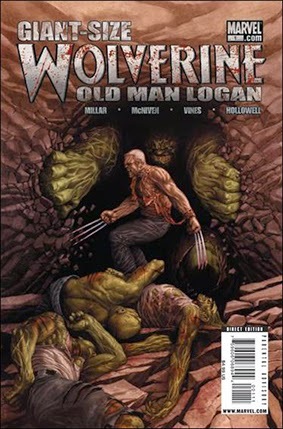 • PLOT SUMMARY: Old Man Logan: Part 8 of 8 - This is it! The moment you've been waiting for! Prepare yourselves for the most brutal battle in the history of comics as Wolverine returns - and unleashes a tidal wave of bloody revenge! It's Wolverine versus the Hulk Gang to the death! Don't miss the flesh-rending final chapter to the greatest Wolverine story ever told by the peerless Mark Millar and Steve McNiven! Plus-you won't be able to tear yourself away from the gallery of covers, background material, behind-the-scenes extras, and all-new pinups that fill out this GIANT-SIZE SPECTACULAR!